The first colour scanner (CMCR) in Birmingham was CMCR 6 which was based at the OB base which was then at Carpenter Road, Edgbaston. It was equipped with 5 EMI 2001 colour cameras which had the lens within the body of the camera. 4 of the cameras were used normally and the other was used as a spare and for parts to repair the others. BBC Birmingham did not have a Colour TV studio before Pebble Mill opened in 1971. 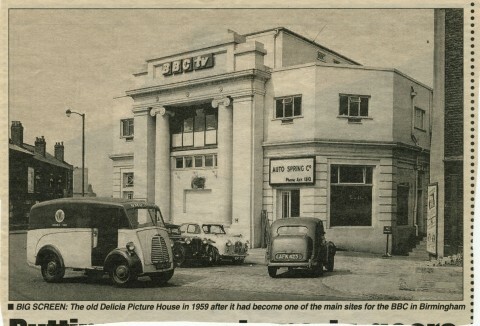 The BBC had a studio at the Cinema in Gosta Green in Aston. It was fitted out in the days of black & white and during the late 60s until Pebble Mill opened CMCR6 would be used part of the week to produce Dramas or Drama series in colour. I think that CMCR6 was at Gosta Green on a Wednesday & Thursday each week and would then go and do a Match of the Day or other OBs returning on Tuesday for the rig for the drive in. CMCR 6 was moved to Kendal Avenue in the 1970s and replaced in Birmingham with CMCR 9 which had Philips PC80 Cameras. This meant that the cameras in the Studios at Pebble Mill and the ones on the OB unit were different which caused problems with maintenance, spares etc. The building at Gosta Green is in the course of being re-modelled to provide a specialist research centre for Aston University Thankn goodness the frontage has been retained – and all the new build is to the rear. Would have been a loss to the city if it had been demolished. CMCR6 did not go to Manchester after serving in Birmingham. In 1972 CMCR6 returned to Kendal Avenue and CMCR9 replaced it in Birmingham. This rationalised the fleet at Kendal Avenue as they were then all EMI 2001 equipped. Manchester already had CMCR7 (North 1) and CMCR8 (North 2). Eventually CMCR9 was transferred to Manchester in 1979 and became North 3,which it still is! (in retirement).